I am so behind here! 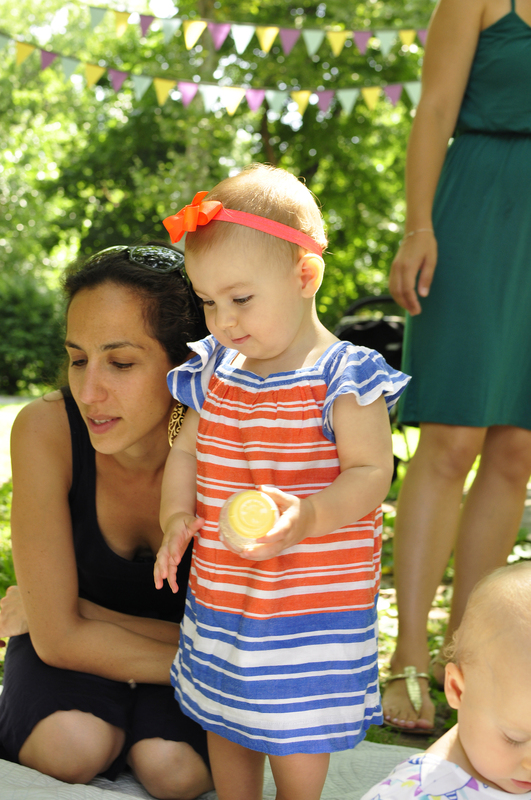 Last Saturday we had Sabine’s little birthday party with friends at a neighborhood park. She had a grand time being the center of attention! The theme was “Hippos Go Berserk” from the Sandra Boynton book and flags to match Sabine’s party dress. For the cake I ordered a Parve cake from Mother’s Bakery and had them match the purple frosting to the purple in her dress and the decorations. 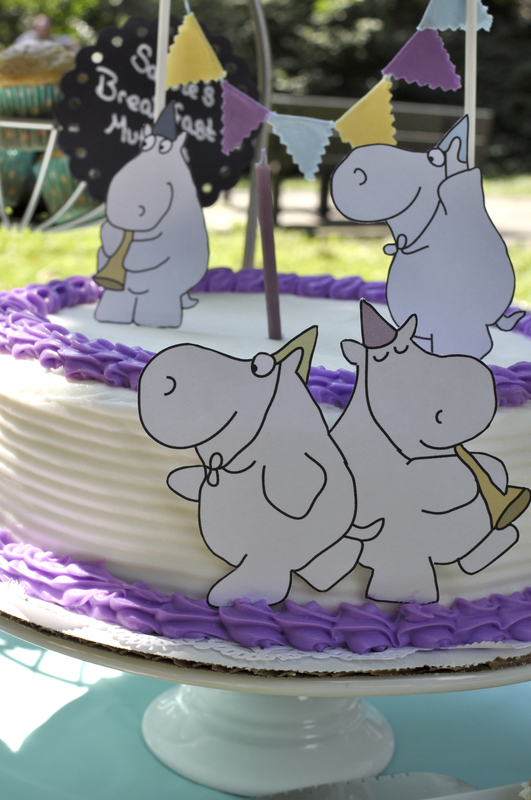 I topped it with one purple candle, a tiny little bunting I made and some hippos I drew, printed and cut out. Since her party was from 10:30 to noon (we ended up parting it up until 1:30 though! ), I selected some breakfast foods to offset the enormous cake bomb we all ate at the end. We had fresh fruit (sadly I did not get a photo of it uncovered! ), Deviled Eggs with tomato and KY bourbon smoked paprika, NY bagels with cream cheese, shaved English cucumbers and chives and Sabine’s breakfast muffins – a sugar-free, savory muffin that she eats daily, sans breast milk for our guests! Sabine shows us what a great muffin eater she is. Since I was taking the photos of our party I missed quite a few of the pretty home-made details that made it so special. I made a bunch of flag garland that matched Sabine’s dress that we hung in the trees. You can see a snippet of them in the above photo. 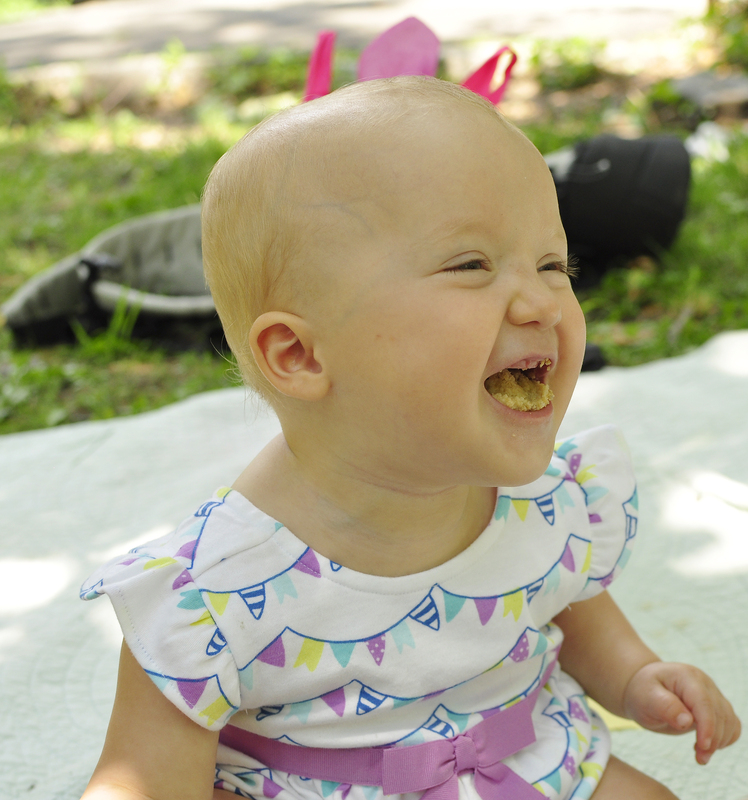 I also made a sweet little garland that said “Sabine Is 1!” that we hung on the picnic table. I made Sabine an adorable little hippo party hat that she refused to wear. Instead I held it over her head for some photos. 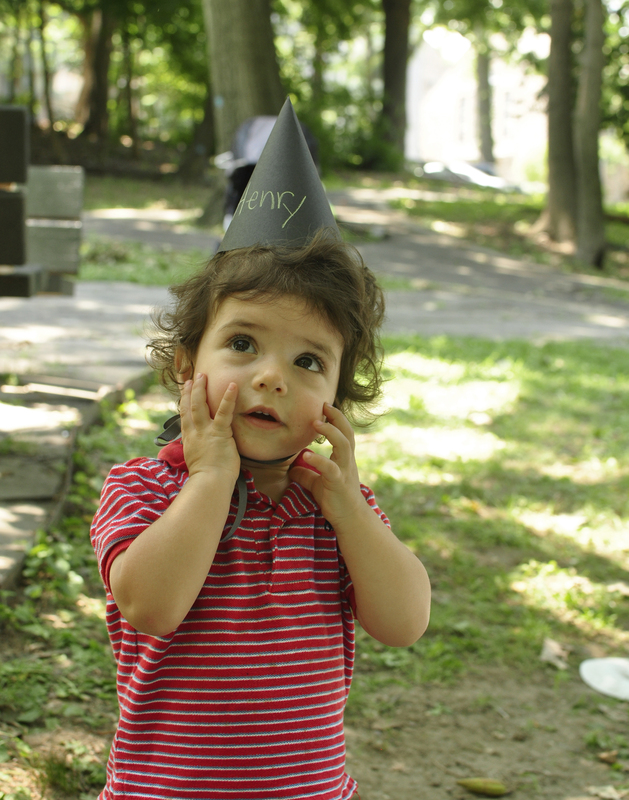 I also made a bunch of chalk board party hats and had a little craft station where our guests could decorate a hat. And of course, no 1st birthday party of the 1st grandchild is complete without grandma trying to upstage (and out-craft) the new mother. My mom made 10 amazing little hippo hand puppets for us to give out in our favor bags. They were a HUGE hit with the kiddos. Sabine thought being sang to was insanely exciting. She also had a lot of fun attacking one of the hippos from the cake. 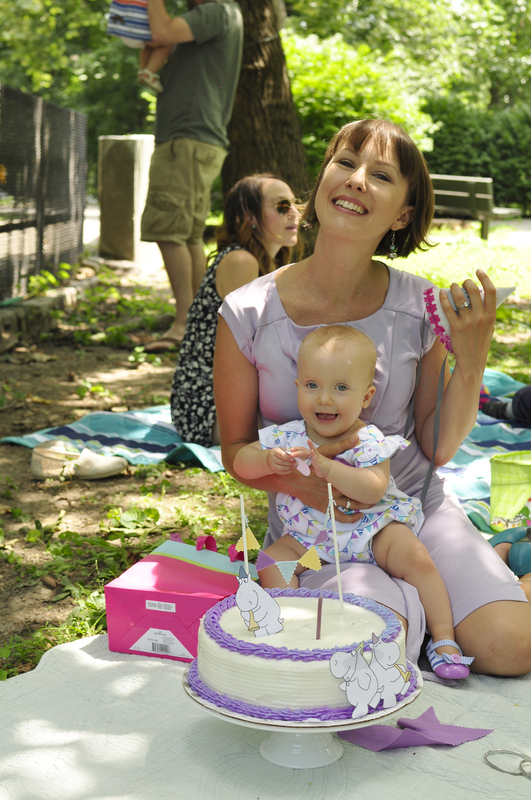 We blew out her candle and made a special wish (no it was not for a sibling) and then all ate cake… except for Sabine. 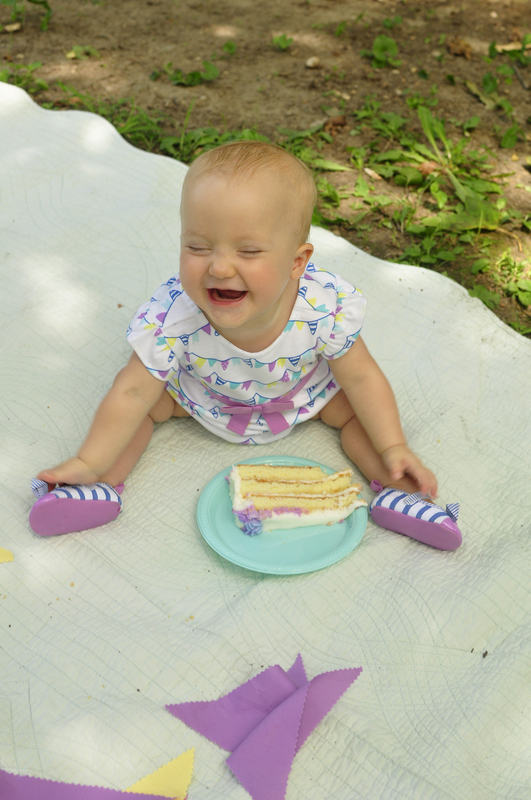 She was not into cake this time around but instead spent the time hamming it up like made for her guests. I had so much fun preparing for this little party. My mom used to throw the most elaborate parties for us when we were kids and it makes me happy that the torch has not been passed … even though she still tried to show me up! I kid, I KID! What a beautiful party! I love that you sew and can make all that garland. I dream of making sewn buntings and garland! What an adorable party theme! I love Sandra Boynton and I love all the little creative ways you made the party special. Happy birthday to your girl! What a cute party! I love her little coordinated bubble suit. I admittedly love planning my kids parties too- so much fun! So amazing and it looks like it was an awesome first party! 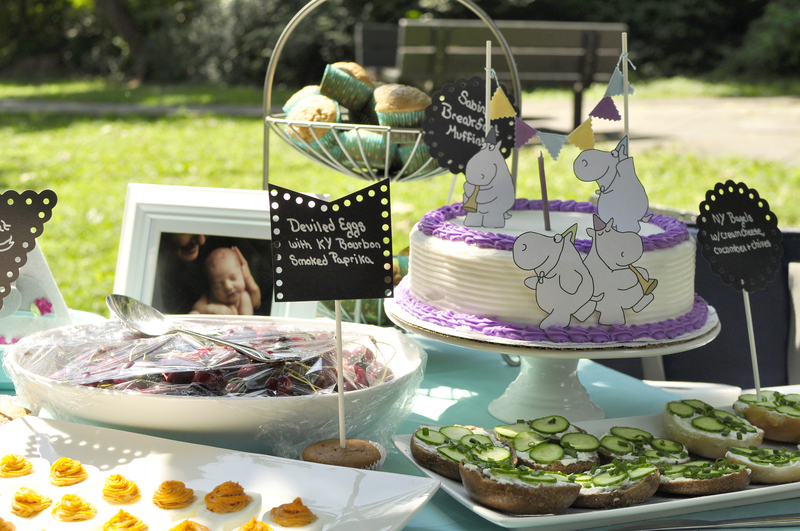 You always amaze with your beautiful creations,Sabine is going to have the best parties! Happy birthday Sabine! She looks like such a happy baby! ps though, HOW DO YOU HAVE TIME FOR THIS? DO YOU SLEEP? EVER? i can’t even get my laundry folded. and that’s if i even get it done…. there’s def some secret to time management that i’m missing out on here. please share if you have advice!! Looks like a wonderful, beautiful, super fun day, Belle! Hooray! What a cute party! 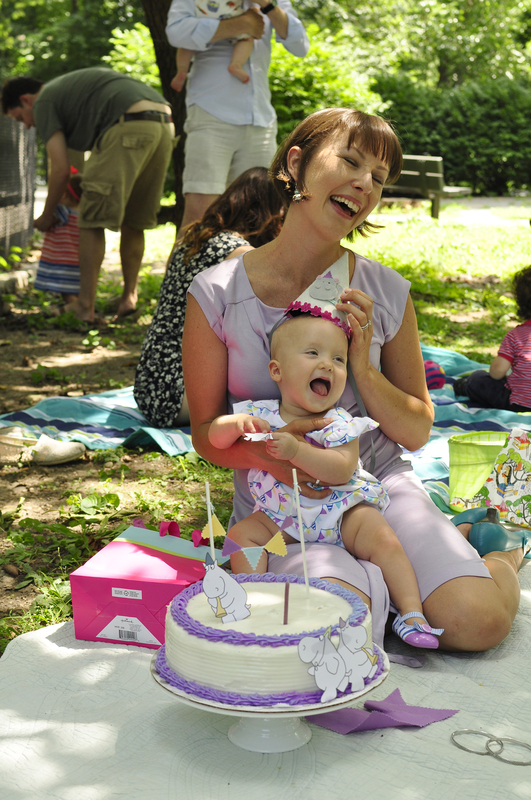 Looks like Sabine had a wonderful birthday!